Over a year ago the news thundered that IBM's subdivision of personal systems was sold to chinese Lenovo. This winter the new owner announced the first models of notebooks under its own trademark, built on IBM technologies. It had been analyzed in the coverage here. It's time that we should have a look at these notebooks and their accessories. By the way, I again want to comment on the way the representative office of this large company works here in Russia - Lenovo adopted from IBM a remarkable position to make journalists run after the representative office, not vice versa. That's why we again had to borrow a notebook from a distributor – the company that didn't have to work with press, but… These are peculiarities of Russian realia. As you may remember, the C100 model (the cheapest model in the new Lenovo series) was demonstrated at the presentation in February. Even though it came with a good bundle, the model produced an oppressive impression with its cheap plastic casing as well as some peculiarities of ultra-cheap notebooks (I have already come across them before). They made you think that the design was spoilt deliberately (for example, the keyboard layout). Later on, the company introduced better models, the N100 multimedia series in particular. The manufacturer designed this model for small business. According to the dug up information, the N series is a reliable (IBM reputation) and high-performance notebook for small business professionals. I repeat, this notebook is designed for business usage. At the same time, the manufacturer stresses that it's a multimedia model: "Stereo speakers on both sides of the keyboard should generate more powerful sound and enlarge the audibility zone". This "multimedia" feature (why include it into a business model?) also manifests itself in a glossy widescreen panel, Lenovo care tools, and some additional software "necessary for your business". We'll see what the manufacturer meant. Theoretically, these notebooks are sold in the same places as Thinkpad models, they are repaired in the same service networks. One-year warranty. Full specifications of the model can be found here. Charge time - approximately 3 hours. The N100 has a scarce bundle. It includes a PSU and a "localized" power cable. An interesting fact: my T30 came with an American PSU. It had a very good two-pin connector, which was compatible with power cables from consumer electronics with thin plugs. It was very convenient. "Localized" products (like my t41 or Lenovo N100) come with a three-pin PSU with a ground contact (I wonder why we need it here in Russia??? I have rarely seen correctly grounded sockets here. Though IBM and Lenovo clients may have them) and … a 1 m cable, thick and heavy, with a euro-standard plug with thick pins, which do not fit into "Soviet-type" sockets! You will be especially happy to find that out somewhere in a hotel. The point of such "localization" escapes me. I would have understood, if this localization had been called "Euro", but the box runs "RUS". Besides, the bundle includes several papers (quickstart, for example), a maintenance manual (a thick, well-illustrated booklet), legal issues in several languages (mainly about wireless). The notebook is packed in a special polyethylene bag with warnings in all languages. The warning in Russian is written with a mistake, as usual. However, it's true for all IBM notebooks (that's just this series, or nobody cares). In my opinion, the difference between the modes is rather small. It can be explained by two reasons - either the processor is in power saving mode anyway, that is the test cannot load it significantly, or the power saving procedures are inefficient. The keyboard produces a nice impression. One of the positive sides of this layout is the long-awaited appearance of the Win key, missed by so many users. The keyboard is not narrow, all the keys are of normal size. At the same time, the keyboard layout has some drawbacks. Traditionally, the home/end/pgup/pgdn group of buttons suffered the most. OK, I can live with the pgup/pgdn buttons near the cursor buttons (I even came to like this layout when I edited this article). But home/end buttons should be pressed together with Fn (you have to use both hands, as these keys are in the opposite sides of the keyboard) practically means that you have no such buttons on this keyboard. The second major drawback is the location of ins/del. Many manufacturers place these buttons in the top row on the right. In this case it's really far to reach them from the cursor keys, when you edit some text, but that's not much of an irritant. Besides, it's sort of a "precaution". In case of Lenovo 3000, these buttons are not at the outside, they are in the row of other keys. That's it's practically impossible to find them by touch. That's very inconvenient when you edit texts. It's especially annoying to look for the Del button each time you need it. Funny, but the keyboard and the touchpad produce a very good impression when you use them, just like IBM devices. I would even say that this notebook was a tad more convenient to use than my IBM 41 – the keys are easier to press. At the cost of slightly worse tactile feedback, the keyboard in Lenovo 3000 N100 became softer and easier to press, so your hands won't tire from long typing (that concerns girls as well). As far as I could see, the keyboard uses the same design of keys as the IBM keyboards. The touchpad (it has only two keys) also produces a nice impression, though it's a tad worse than the IBM device (its surface is smooth and feels differently). 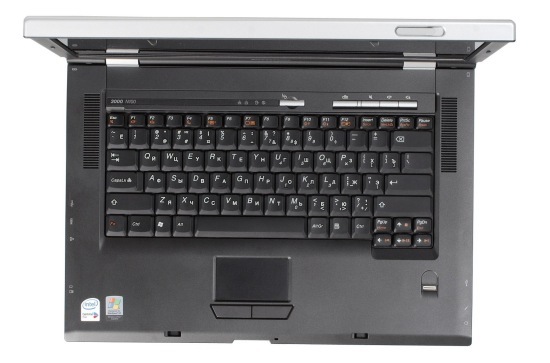 Lenovo 3000 has four additional keys. Three of them are responsible for volume control, the fourth button starts the lenovo care utility, which unites a number of utilities and programs to make your work with this notebook more convenient. What concerns volume control, it's very strange – it uses the standard Windows volume control. That is if you press the Mute button, Windows volume control will pop up, the Mute check box will get selected. Another press on the button will turn the sound on, the windows volume control again popped up. The problem here is that your application will stop being active, so that you have to switch to it manually. That is if you adjust volume when you watch a movie, for example, most players will fall out of fullscreen mode and the volume control window will become active and appear on top. That's much less convenient that in IBM notebooks, for example. Lenovo 3000 also has a number of shortcuts, that is combinations of some buttons with Fn. Funny that Fn labels on the shortcut buttons are orange (Lenovo's color), while such labels on IBM notebooks are blue. They include volume control (it works just like the dedicated buttons, I don't understand the reasons for having duplicates), brightness control, standby/sleep buttons, built-in/external display, as well as wireless manager (similar to that in IBM notebooks). Besides, some functions are accessible only as Fn combos - e.g. scrollock, numlock, etc. Indicators are divided into two functional groups. One of them is over the keyboard, the other is on the front panel and looks forward. Indicators over the keyboard (notebook status, HDD activity, numlock and capslock indicators) are located in a convenient place, no problems with reading them. The front panel indicators are not quite readable, if you are close to the notebook (and are looking at it from above). They are not visible well, when the display lid is closed and the notebook is on a table (if you look at it from above). This group includes wireless indicators. If you leave them enabled, it will have a negative effect on the battery life. And the shape of the case… The notebook does not look like a book. The rounded rear does not resemble a book back. It produces a strange impression, especially in combination with straight lines of the rest of the case. No attempts were made to "break" the sides, so the case looks a heavy flat brick, especially when closed. And the skewed front produces a lot of strange associations - from the side, the closed notebook resembles a freight carrier, and a crocodile's jaws - when ajar. The attempt to follow the success of the Compaq 800 design was a failure. What concerns the assemblage quality, we had no gripes with it – all components are firmly fixed, we noticed no creaks or backlash. Moreover, the notebook offers a number of very good technological solutions. For example, the lid overlaps the base of the notebook when closed to prevent dust from getting inside (pay attention to the curvatures at the sides of the lid and the inverted curvatures on the keyboard panel). It's also very nice that the keyboard is slightly slanted to the bottom at the edge, which won't cut into your hands when you type. The lid is secured with two latches. They open up with a single slider, which is easy to move with your right thumb. The keyboard panel contains port labels right over the respective ports at the side. They make it very convenient to use these ports, especially when you don't remember their layout by heart - you don't have to look them up. The port layout is very ergonomic. Let's analyze the layout of ports. We'd like to note the number and layout convenience of USB ports. It's good that the front panel does not contain any ports – no cables sticking out of the front panel, no chances to get caught in them, the notebook can be clasped at your stomach, etc. Along with the indicator, we can see here a wireless switch (a single switch for all interfaces, that is it can turn on/off WiFi and Bluetooth). The left flank houses Expresscard and a card reader above, LAN port, IEEE 1394 port and a single USB port. Then follows the CPU cooling system and a Kensington hole. I would have swapped the LAN and USB ports, but that's not critical. 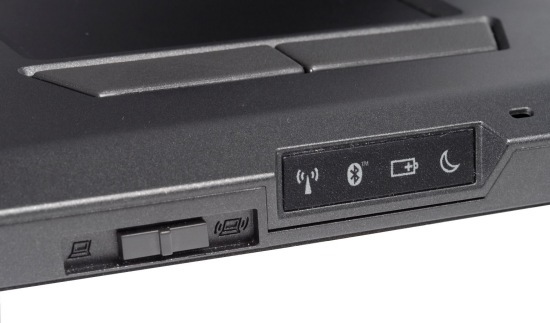 The rear panel houses a power jack (it differs from the standard IBM connector, the new jack is used in all 60-seires Thinkpad models and Lenovo 3000. The power is also different now - 20V 4.5A instead of 16V 4.5A), modem jack and a video out. The right flank houses a VGA connector, an optical drive (DVD-RW (Dual Layer), three vertically arranged USB ports and audio jacks – microphone-in and headphones-out. As you can see, the layout of connectors is very convenient to use. There is a web camera above in the display frame. The notebook is equipped with a 1680x1050 glossy panel. It's obviously a TN-film panel. But thanks to modern technologies and the glossy surface, the image looks very good, especially its dark hues. It's convenient to watch movies, you don't have to adjust the panel position each time you move your head. Photos also look vibrant and saturated. If you don't incline the display lid too much (that will lead to color distortion and inversion), the picture is good. But the glossy surface has its cons – if there is a light source behind you, or just a white object, while the display is dark – this white object will reflect in the panel. If you watch a movie and the light falls on your face, you may have to enjoy your reflection in night scenes. The audio system is a mess. That is, it's not really bad. The speakers offer the usual notebook quality level. It's just that in combination with the good panel, which shows movies without any problems, they are not enough – you want better results and higher volume. But the N100 is equipped with standard small speakers, which are used in all notebooks and offer neither quality nor high volume. They suffice for making sounds in a quiet room. But when you need more or less high audio quality, you should use external speakers. I failed to heat up this notebook – the entire surface was cool even after a couple of hours in Unreal Tournament 2003. I did not resort to extreme load. Fan noise is also moderate, it's not annoying. 3 hours in office applications – quite a decent result to my mind, especially for such a powerful notebook with a large display. Besides, I have an impression that power management of either video or Core Dual is not organized well. So the battery capacity is quite adequate, the notebook works on the level of most models or even a tad better. As we know, a notebook is not just a piece of hardware, it's a combination of hardware and software. As a rule, cheap notebooks come without additional software or with a minimal bundle. Users have to buy programs on their own. Brand computers are very often bundled with a rich set of utilities to maintain the operating system and solve some important problems with the bundled software, which allows to save time and efforts on searching and choosing additional software. IBM with its thinkvantage gets the garland here. It includes a great many utilities for various tasks. Lenovo 3000 also comes with some utilities, both proprietary and third party ones. Lenovo Care utilities are a set of programs with a common launcher. It can be used for fast configuration of some functions (for example, to get direct access to display properties) and launch a number of programs (for example, the Watch a movie option starts WinDVD). Besides, Lenovo 3000 notebooks come with certain software. First of all, these are multimedia programs – WinDVD 5, Intervideo WinDVD Creator 3, and Roxio easy cd creator. Besides, the computer has preinstalled Diskeeper lite (you can start defragmentation only manually, which is OK for an entry-level computer, but the program still has an agent, which bugs you with messages about excessive fragmentation of a drive and offers to buy a full version). There is also IBM java webstart 1.4.2., PC-doctor for windows. Third party programs include Picasa2, which creates a database of images and multimedia content for quick search (I doubt that this program is useful, considering how much memory it takes, I just cancelled the process of creating a database - too long), and google desktop. Besides, the bundle includes a trial version of Norton Internet security. This full-featured suit for protecting your computer is good for beginners, because if offers a decent protection level both from viruses and from network attacks. And it does not need extensive configuration. Security utilities also include omnipass manager – a good security utility, which supports a fingerprint scanner, installed in some models. You can hardly overestimate it, as home users and small business users take security rather lightly, passwords in particular, forgetting them or writing them down right on the monitor. That's why it's very convenient to prove your identity with your fingerprint instead of typing passwords. Besides, the notebook comes with a lot of utilities inherited from IBM. First of all, these are Lenovo care utilities (help manager, help center, lenovo care launcher, Lenovo advice center and presentation director, similar to the utility from IBM). The bundle includes a number of Thinkvantage utilities from IBM as well. Access connections – this utility creates its profiles for various networks so that you could switch between them really fast (DNS settings, printers, etc). System update – this program checks for utility and driver updates. As you can see, the bundle includes lots of various software to facilitate your work with this notebook, especially if you don't understand the particulars. Unfortunately, Lenovo care and the utilities are not localized, so representatives of small business (not all of them know English well enough) will hardly manage to use them. But the problem is not with the utilities as such, but with their localization. We should also mention a special program to restore the operating system, which also migrated to Lenovo notebooks from IBM. The system restore starts after BIOS, but before Windows. This system allows to perform a number of actions, it even has an Internet browser! I didn't manage to use it, but the problem might be in network settings. The system restore admits that it's Thinkvantage Rescue and Recovery 3, Think (Think is a new logo of thinkpad notebooks, not the 3000 models) again demonstrating the kinship between these series and manufacturers. Then starts the restore process, which consists of two stages – copying and extracting archives (it ended with a DOS message - qecho.exe bad command or file name) and batch installation of drivers. I was surprised to realize that I liked this notebook. It's a good multimedia notebook with a very good IBM-like keyboard. The last fact almost reconciled me with this poor layout. A good panel, powerful configuration (though the latest Star Wars game was a bit slow, but you cannot expect more from a notebook), the excellent thermal mode. But the official positioning of this model comes as a surprise. When a home multimedia computer (in all parameters) is positioned as an office model, it naturally surprises interested people. Corporate notebooks are known to have different requirements. Requirements to models for small business are also different - simple configuration at a low cost. Small business has small requirements. And small budgets. G40/41 attempted to cover this segment, the "e" models (r50e, for example) are also designed for this segment. This one is a powerful multimedia notebook with a good processor and video (!! ), widescreen panel, multiformat optical drive, card reader (!) etc. And this notebook is designed for small business, where 90% of its features won't be used and its price is shocking. Speaking of prices. 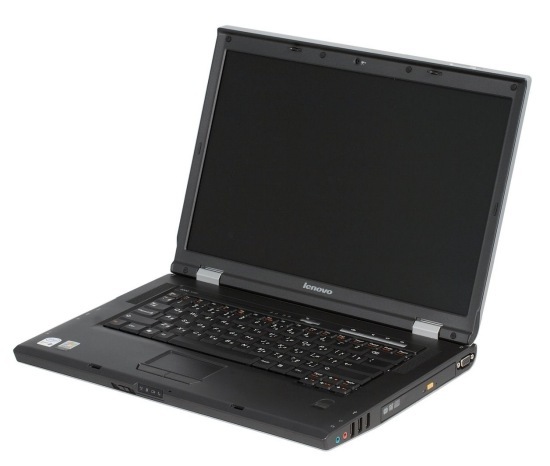 Top Lenovo 3000 N100 models are even more expensive than similar Z60 models and offer a more powerful configuration. Considering the vague positioning of the Z series and its silver lids, the company risks mixing up these product lines and compete with itself. I don't know why the company needs it. The other components are also questionable. For example, why install Picasa, if it's a business model? We should also mention another thing. The built-in utilities are very convenient, they are ergonomic and functional. At the same time, Lenovo 3000 series reveals a number of bugs, or maybe peculiarities of these notebooks. For example, the wireless manager. This small utility offers an easy way to enable/disable wireless interfaces (you just press the button to enable the interface) except for one "but" - our notebook was equipped with Bluetooth, but the manager lacked it. So it was always on, it could be disabled (except for barbarian ways) only with the mechanic switch on the front panel, together with WiFi only. There is also a problem with Access connections. This program does not replace the Windows utility, that is you can connect to a wireless network both ways. But if you use the standard Windows manager, the Access connections utility does not detect the connection and disables the wireless interface in several seconds, breaking the connection. And finally, Lenovo 3000 series demonstrates an unpleasant peculiarity, which can be found in many notebooks – this model starts beeping (approximately once a minute), when its battery discharges (below 10%, I think). No way to disable it (you can just turn the sound off). So if you want to watch the last 10 minutes of a movie to the end with an almost discharged battery, your fun will certainly be spoilt. It's a very good, functional, and ergonomic notebook with a good keyboard, which can be used for intensive work. But this notebook is a home multimedia station rather than a small business model. 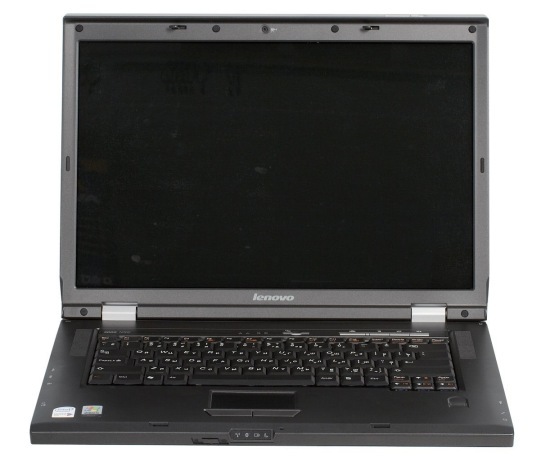 I don't think that Lenovo 3000 N100 will be popular, as far as a difference in the approaches is preserved. Besides, taking into account the considerable price for such a brand (even if with a good configuration) as well as a plain design, its prospects get very vague. But despite some positioning mistakes, even such a choosy person as myself liked Lenovo 3000 N100 much – it shouldn't disappoint its users.